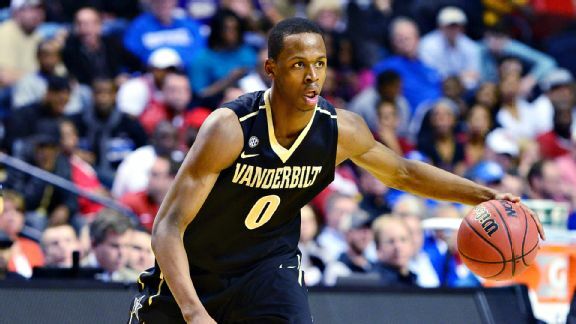 Is Vanderbilt’s Rod Odom Shooting His Way on to the NBA Radar? Rod Odom has been more than a pleasant surprise for Vanderbilt this season. The senior picked up this week’s SEC Player of the Week award, and should be in the discussion to land on an all-SEC team. His numbers are up across the board and this isn’t just a product of the over 35 minutes per game he’s been forced to play for Kevin Stallings. He’s shooting considerably better than last year despite more attempts per game, and has essentially come from under the radar to become one of the best scorers in the league. He’s also the rare breed of player that makes the hearts of NBA scouts beat just a little faster, a big man who can shoot. This got me thinking, does Odom have a chance to shoot himself from relative obscurity onto the draft radar? The NBA loves shooters with size, and the senior has shown that he can really stroke it. Any player with size shooting over 40 percent from deep will get at least a glimpse from scouts. Non-traditional lineups filled with versatile players have been on the rise in the NBA for a few years, as teams try to create space for LeBron James, Derrick Rose, James Harden and others by surrounding them with shooters. Shooting from a forward is a bonus, and a big reason why Florida’s Erik Murphy heard his named called in the second round of last summer’s NBA Draft. Odom’s game this season is similar to Murphy’s production in his last two seasons in Gainesville. But despite how well the Vanderbilt senior has played this season, it doesn’t appear that he’s on the same path to the NBA. For one reason, Odom isn’t yet getting much NBA attention. NBADraft.net doesn’t have him anywhere on its February 2014 mock draft, or among its top 100 prospects. DraftExpress.com isn’t giving the New York native any love either. Of course, a lot can change between now and June with prospect showcase tournaments and individual workouts. Nevertheless, Odom has a few hurdles to overcome if Murphy is the measuring stick, and consistency is one of them. Murphy shot a ridiculous 45.3 percent from three as a senior, but the sample size argument was difficult to make since he’d shot an equally impressive 42.1 percent on 140 attempts as a junior. That argument against Odom isn’t piercing since this year’s 44.1 percent has been posted on a sizable 152 attempts. But he’s coming off a junior season in which he shot nearly nine percent lower (35.3%) from three, so it’s a hard knock for him to completely shake. Another concern is what else Odom can bring to the table other than long-range bombing, as shooting alone can only get a player so far. Odom is a tad shorter and lighter than Murphy, and not as good a rebounder as his Gator counterpart. Murphy’s penchant for the three-point line deflated his offensive rebounding numbers at Florida, but he was still able to post a solid senior defensive rebounding percentage (19%) while Odom’s figure is considerably lower (12%). Still, Odom has good athleticism, and could certainly become more than a spot-up three-point shooter if given enough minutes to get comfortable in his role. This piece is not meant to knock Odom. His 2013-14 season has been so good and he’s unique enough a player that any NBA talk shouldn’t set off the crazy bells. It’s also true that he’s posting big numbers as a part of a depleted team with limited options. Defenses know Odom is going to set up shop from the three-point line, yet he’s continued to knock down his looks at an outstanding clip. In the end, however, the odds weigh against him ending up on a NBA roster. For a guy who averaged south of 2.5 PPG just two seasons ago, there would be nothing wrong with that nor would it diminish what he’s done this season in keeping Vanderbilt afloat despite a serious personnel crunch. At worst there will be dozens of European teams lining up for his professional services next season, and that’s a pretty nice position to be in. This entry was posted on Tuesday, February 11th, 2014 at 10:20 am by Greg Mitchell	and is filed under microsites, sec. Tagged: erik murphy, florida, nba, rod odom, vanderbilt. You can follow any responses to this entry through the RSS 2.0 feed. You can leave a response, or trackback from your own site.